Mom's Gone Bronson! : From their little elves, to you! 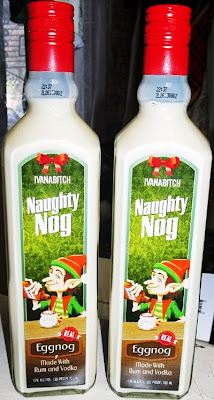 Ivanabitch's Naughty Nog, Review. From their little elves, to you! 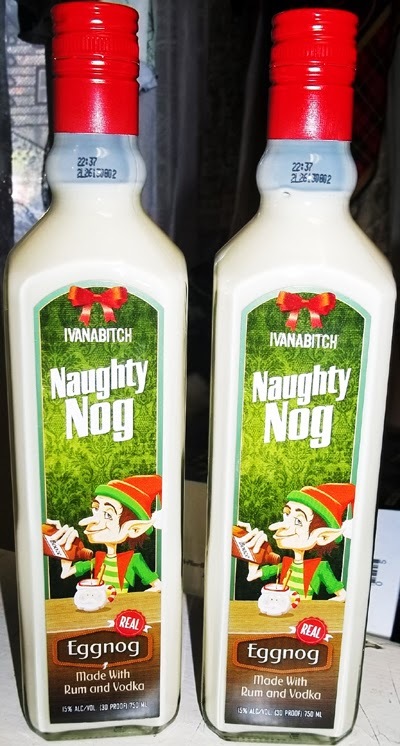 Ivanabitch's Naughty Nog, Review. How about this for a holiday gift this year?! Produced [and bottled] in the Netherlands, but available around the globe, this fabulous, new REAL Eggnog contains 15% alcohol by volume and is 30% proof, making this one heck of a Eggnog you'll not likely forget! Made with rum, vodka, cream and eggs, this is an Eggnog you're going to enjoy over again with the same consistency that you do not always get when making your own - no matter how fun the process may be!! Absolutely no more guess work on your part; you just open and pour! What more could you ask for, other than fabulous quality and taste? Well, you will get that here, too! Naughty Nog debuts just in time for the holiday season and would make a fabulous gift [to those who don't mind a tipple] and is available in 750ml glass bottles for around about $12.99! I tried Naughty Nog yesterday and I have to say that it is smooth, creamy and really packs a punch! The taste is not overpowering though, it is just about right! It feels delicate on the tongue, hits the back of your throat and then lingers for a moment with a delicious, creamy taste of the season! Of course, you can share it with friends - if you really want to - but chances are, you're going to want to keep this all to yourself! Absolutely delicious, this drink is hitting our Holiday Gift Guide this year as we remind you that this is a product geared to those over 21 and to PLEASE drink responsibly! Check out everything Ivanabitch has to offer at their website, which can be found HERE, along with their Facebook and Twitter pages for the latest news right from the little elves themselves! Disclaimer: I was provided with product in order to write this review. My views are 100% honest and my own and yours may differ. Alcohol content is intended for those 21 and over and we encourage you to drink responsibly! Thank you! I love eggnog & that sounds extra yummy! Or naughty depending on which way you look at it. This sounds so interesting! I've never even tried eggnog before but this makes it look good! Goodness. i must try this Naughty Nog! Sounds yummy! Never heard of this product but I will be sure to look for it now. I don't drink but it sounds awesome if I was a drinker! I think we will have to try this , it looks yummy and my Husband loves Eggnog! This eggnog sounds absolutely ahhh-mazing! Perfect for a holiday gathering where people are staying over!